The book Third Space: Landscapes & Windows accompanied Mark Adams' recent solo photography show and comprises a selection of photographs taken between 2000 and 2014 in various locations from southern Spain, the United States, Sweden and northern Britain. These photographs explore the third space – a locale where, according to theorist Edward Soja, ‘everything comes together… subjectivity and objectivity, the abstract and the concrete, the real and the imagined, structure and agency’. 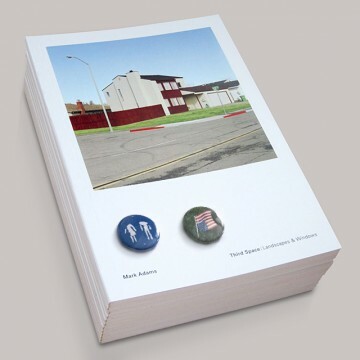 To compliment the show at PS Mirabel, Manchester in March 2015, this book is a retrospective of Mark Adams’ work to date and provides images and selected texts that group various bodies of work together geographically promoting connections and disjunctions.